Surratt Beauty, like the work of its founder, Troy Surratt can be a hit-or-miss thing. 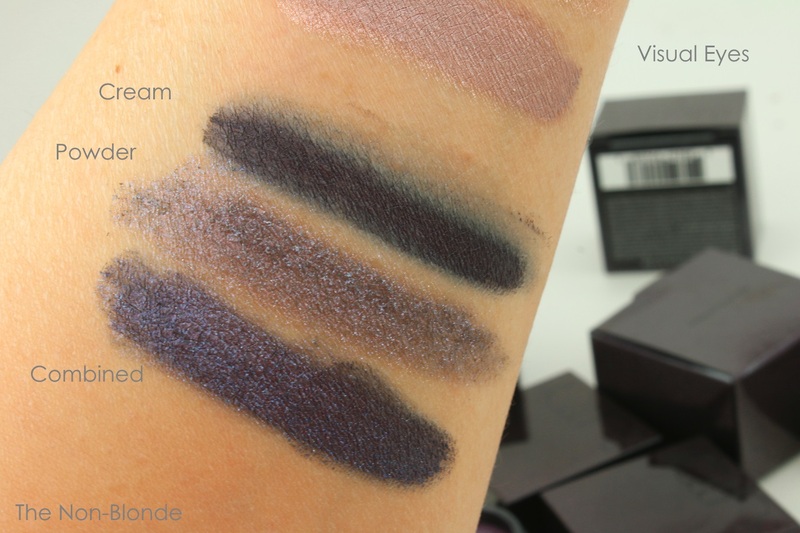 I knew that when I got these three eye shadows from the new Prismatic Eyes range. I also ventured a bit out of my comfort zone when choosing the shades. As you can see, there's a lot more purple here than in my entire wardrobe. I'm still unsure how I feel about that, but I'll post a look soon and let you be the judges. Prismatic Eyes are double-deckers. We've seen these format last year from Tom Ford and I skipped it entirely, because when I swatched one or two at the counter the glitter got everywhere and I thought the quality and shade selection didn't match the $60 price tag. 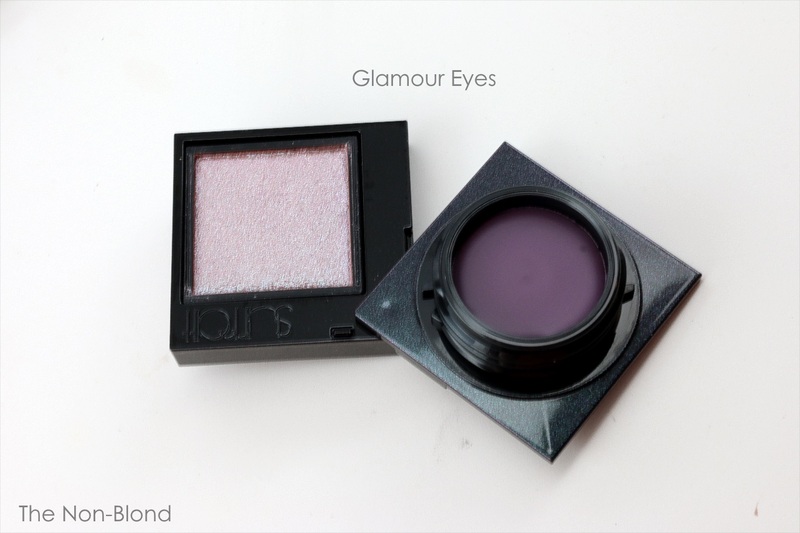 Surratt's Prismatic Eyes captured my interest, though, because of the duo-chrome nature of the powder part, and at $38 a pop I thought it made more sense. The entire Surratt line is made in Japan and reminds me very much of the Addiction brand by makeup artist Ayako. Surratt's availability has actually cured me from jumping through hoops and paying a markup to get my hands on Addiction products, so that's a good thing. I think I'm also more critical of them as a result. So, how do these Prismatic Eyes fare? 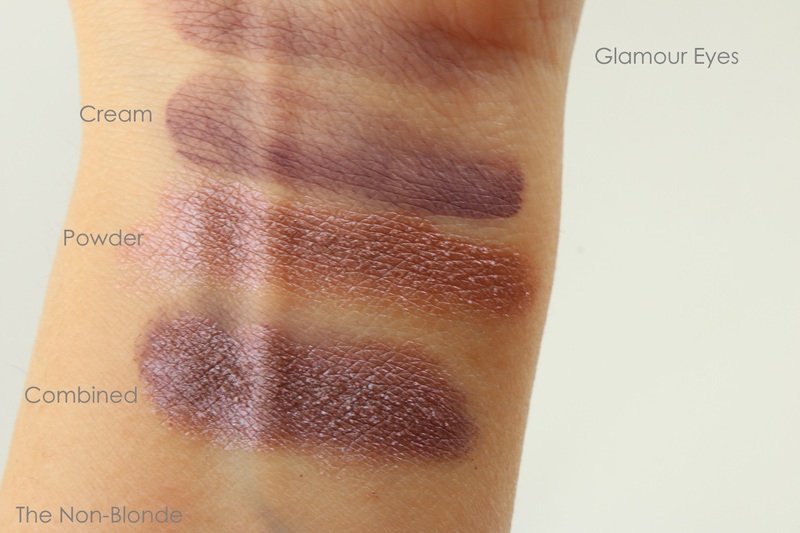 The three I've got, Glamour Eyes, Style Eyes, and Visual Eyes, vary slightly in texture and pigmentation. There's also a learning curve to using them and I can emphatically say that unlike most common cream eye shadows (MAC, Bobbi Brown, NARS) these are not for makeup beginners. You need a combination of brush work and fingers for best results. Also: this is not a daytime product. 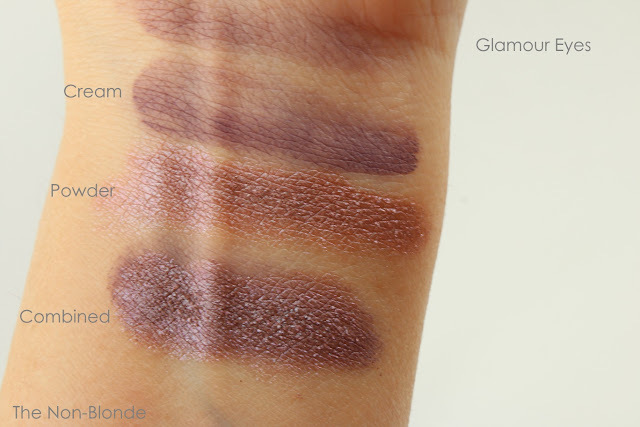 Glamour Eyes has a medium purple base that looks richer in the pan than it is on skin. This one has the most sheer and waxy texture out of the three I've tried, and it made my heart sink a little. You absolutely must warm it up a bit on the back of your hand before applying and carefully build up to get an even coverage. I highly recommend using a tiny spatula to scoop up some product onto the back of your hand and work it a little with your finger. Troy Surratt's own advice, "I like to use the Surratt Moyenne Classique Shadow brush to blend the crème into the lash line and up onto the lid, keeping the lash line rich and saturated while diffusing softly around the edges", will not work here. Neither the color nor the texture are saturated enough. The powder part of Glamour Eyes is the opposite. It was a battle to even photograph this thing in the pan, but the color is richer on skin and more interesting. A mauve with an icy blue duo-chrome that shift beautifully. The texture of the powder in all three cases is out of this world: a thick and creamy consistency , somewhere between Make Up For Ever and Colurpop, that yields to brushes. I recommend a very dense lay-down brush that isn't to small, because as you pack the powder on you don't want to keep things even and not overload some areas. The tackiness of the cream makes the powder grab and adhere nicely, but if your brush is too full of product you will get a significant amount of fallout. Learning curve, and also expect some good cleanup afterwards. Style eyes is the low-key most neutral one of the bunch. 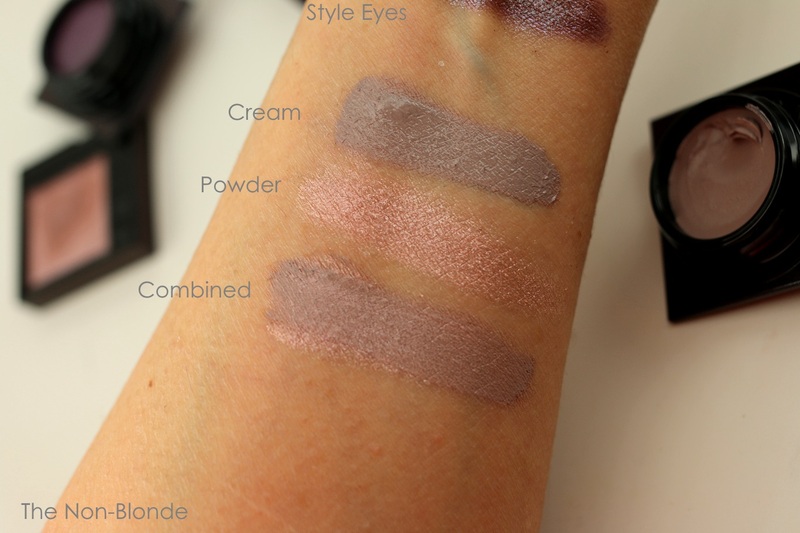 You can see in the swatch how much richer the cream part is. I also love the purpled gray color. It's pliable enough to be applied and blended with a 217 type brush if you want to sheer it out, but why? I'd only do that around the edges. The powder is the less convincing one in this duo. It's a silvered antique rose, which alright by itself, but is more ordinary, and to me it adds nothing to the cream base. Used on its own, a tacky primer or even a glitter glue is a must, because the silver shimmer gets everywhere. I suspect that someone with blue eyes would find Style Eyes absolutely stunning. On me, the pink falls flat. Visual Eyes is a stunner, and if you are of a similar coloring as me, this is probably the only one you truly need. The cream shadow is a very satisfying inky blue, which once warmed adequately can actually be used as a liner with an angled brush (a thinner one doesn't grab the product evenly enough in this case, and you will need some stiffness during application). The creamy powder is a violet-blue duo-chrome, and the layered look is red carpet-worthy. I adore this one and must find more opportunities to wear it, because wow. The creams never fully set dry. They stay put and don't migrate, but don't even think of rubbing your eyes or touching them. The pigments themselves have wonderful longevity, but the texture is just not meant for a rough day (or night), and is better for a civilized event where you stay reasonably sober (or at least can keep on your feet). 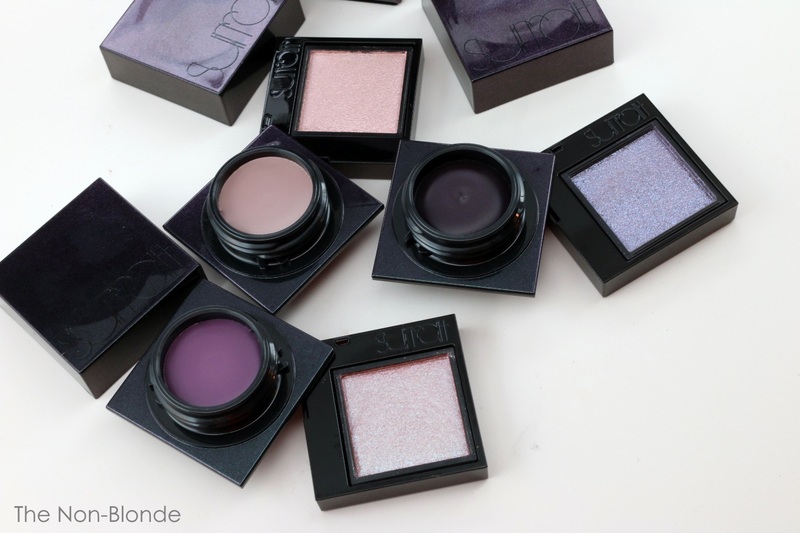 Surratt Beauty Prismatic Eyes ($38, each, made in Japan) are available at Barneys and Sephora. Certain colors get in and out of stock, so it's recommended to call several counters and/or sign up for email updates if you're chasing one shade in particular. I'm taking notes, Visual Eyes is the one to shoot for! i like the style eyes duo! I actually wore it during the day this week and it worked beautifully. Surrat is available from Mecca! It's on my list of looks to do and post. People are going to either love it or scream at me to take it off. Visual Eyes is incredible looking! The powder shade is making me swoon with that glorious duochrome! I'm definitely going to have to see all of these in person now. Thank you for giving me enough reason to migrate out from my warm cave. Visual Eyes would look spectacular on you. Kate above said it's available at Mecca, but I suspect these are not your style, LJ. You may love the lipsticks, though. They have a wonderful texture and finish. 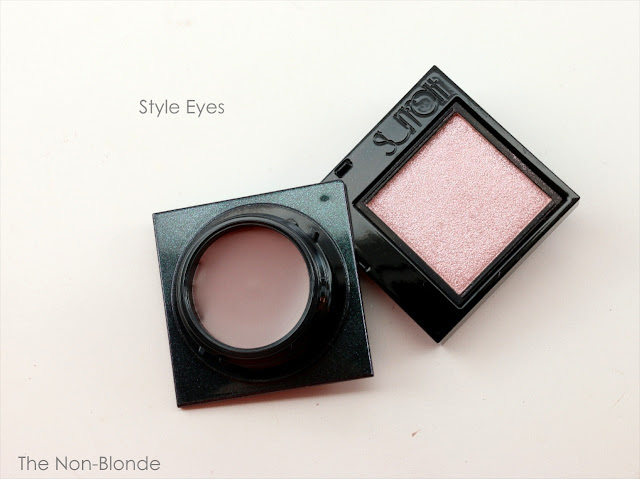 I love the color of the cream shadow in Style Eyes (I agree with you that the pink powder would be flattering on someone with blue eyes, but I don't think it would do much for me). But I like the color of that cream so much I'd consider getting the product just for that. 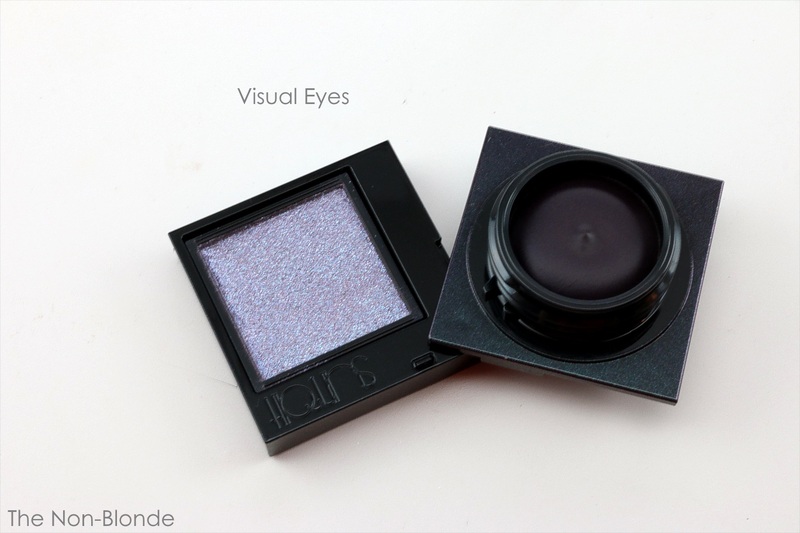 I have other sparkly eyeshadows I could layer on top of it, but I think the powder from Visual Eyes would be stunning over it. I would love to see how Visual Eyes looks on your eyes -- I love those colors but worry that the cream in that one would be too dark for me. I can pull off a lot more color than the average person who share my skin tone. I think it has to do with having deep sunken eyes and naturally dark lids. It takes a lot of the edge away. What I can't do is serious brights and neons. No. Never. Ever. The powder over a cream concept has been popular for a very long time even when not purchased as a duo. Whether monochromatic or totally different but compatible colors, some interesting effects can be achieved when layering. I haven't tried the duos by Surratt yet as I want to actually see and test them at the counter. Because I've had some major hit or misses with Surratt, his line is on my try-before-I-buy list. As for Tom Ford's duos, I actually like his fairy dust when applied over a cream and I tend to use it quite conservatively. I just press my fingertip onto the glitter shade and then press it onto the ball of my eyelid before the cream shadow sets. Done! It adhere's without any fallout and I get a subtle bit of sparkle that is fun and glam without being real obvious. I can easily imagine it making a terrible mess, though, if someone is applying it with a brush or is going for a very glittery look. Finger application seems to be key with these products. I used to be all "eww... germs" but have learned to deal. The one thing I can say for this glitter is that when carefully applied with a finger it sticks nicely (better than MAC pigments that require at least some Fix+). I'm curious if you'll end up buying any. These look like waaaaaaaaaaaaaay too much work to get a good result. I will pass. Thank you for your HONEST review. My pleasure. They're definitely not for everyone.